Ceevilian casualties: 27,927 Boer ceevilians died in concentration camps, plus an unkent nummer o Africans (107,000 war interned). 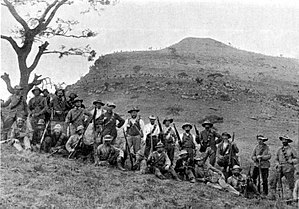 The Seicont Boer War (Dutch: Tweede Boerenoorlog, Afrikaans: Tweede Vryheidsoorlog, leeterally "Seicont Freedom War") itherwise kent as the Seicont Anglo-Boer War or the Sooth African War, wis focht frae 11 October 1899 till 31 Mey 1902 atween the Unitit Kinrick; an the Sooth African Republic (Transvaal Republic) an the Orange Free State. ↑ Lairger nummers o volunteers came frae the Netherlands, Germany an Swaden-Norawa. Smawer forces came frae Ireland, Australie, Italy, Congress Poland, Fraunce, Belgium, the Roushie Empire, the Unitit States an Denmark. ↑ "Caring for the soldiers health". Nash's war manual. Eveleigh Nash. 1914. p. 309. Retrieved 22 August 2009. ↑ "The Commissariat – The Red Cross – The Hague Court". Europe at war. Doubleday, Page & Company. 1914. pp. 183 (n198). Retrieved 22 August 2009. ↑ "South African War". Encyclopedia Britannica. Retrieved 5 March 2016.